The English use the Italian word condottiere to indicate a leader of mercenary troops. Italian historians usually call them capitani di ventura (literally commanders of what will happen), a term which stresses the fact that they fought for who could pay them best and often switched sides. During the XIVth century many Italian city states such as Florence, Milan, Siena and the Republic of Venice became so rich that their citizens preferred to pay mercenary troops to fight for them. Mercenary troops were often recruited abroad, but some of them came from the poorer parts of the country. Montefeltro is a mountainous region around Mount Carpegna (1,415 m/4,642 ft) at the junction between Northern Italy and the peninsula. 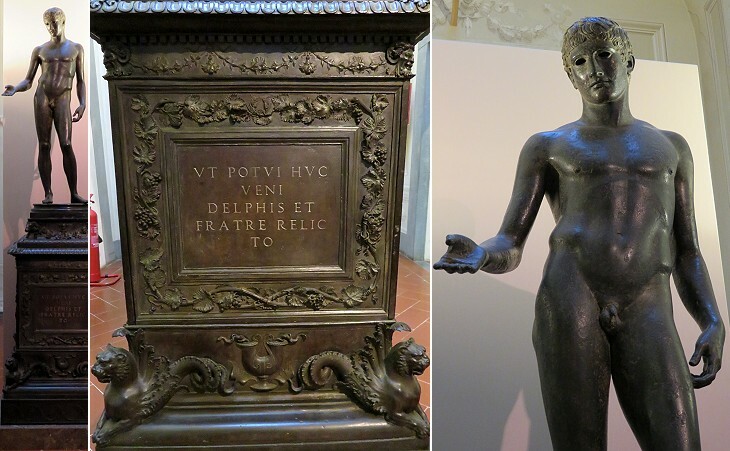 Its name is believed to derive from Mons Feretrius, after a temple erected on a mountain (today's San Leo) by the Romans and dedicated to Jupiter Feretrius, the god to whom they donated spolia opima, the armour, arms and other effects of an enemy chief. 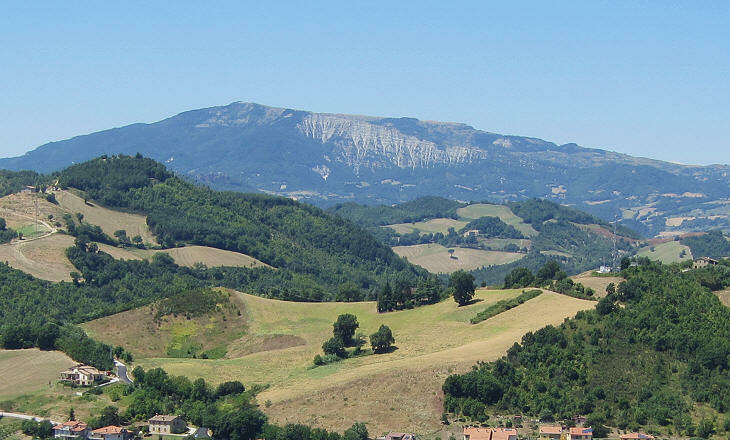 According to other historians in an ancient local language Montefeltro meant Mountain of the Shepherds, because the first inhabitants of the region were either shepherds or lumberjacks. Two families of condottieri originated from Montefeltro: the Malatesta, who had the centre of their power at Rimini and the da Montefeltro (aka Counts of Carpegna) who made Urbino the capital of a small state which lasted until 1631. These two families fought each other for the possession of coastal towns and for key locations inland. In the second half of the XVth century they built state-of-the-art fortresses to protect their territories. The image used as background for this page shows a slit for guns in the fortress of San Leo. 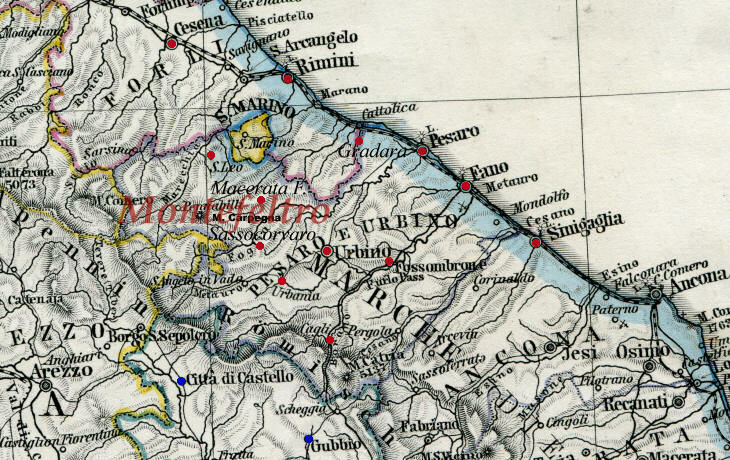 In the XIVth century the Malatesta acquired control over many towns from Cesena to Senigallia and Ascoli, near the border with the Kingdom of Naples. 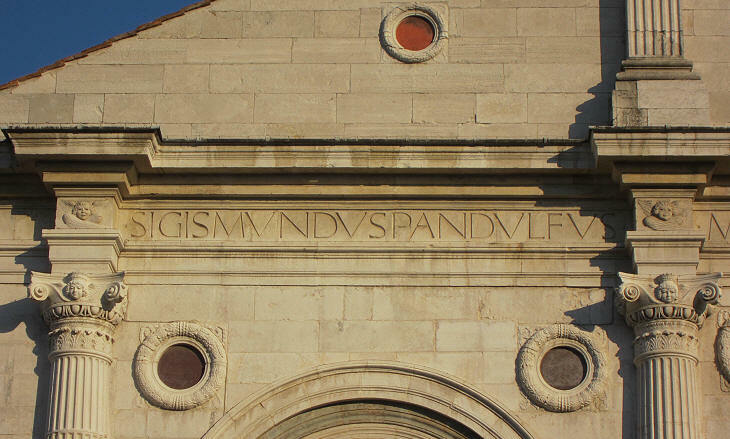 Usually military men are not too keen on art matters, but Sigismondo Pandolfo Malatesta was so imbibed with Renaissance humanism that he commissioned Tempio Malatestiano, a building which is considered a milestone in the history of architecture. He brought the power of his family to its zenith, but he was eventually defeated by Federico da Montefeltro near Senigallia in 1462 and he had to relinquish all his possessions, but Rimini. Federico da Montefeltro enlarged the family possessions he inherited, after being appointed Vicar of the Pope in many of the towns he had captured from the Malatesta. In 1474 he was appointed Duke of Urbino by Pope Sixtus IV and his daughter Giovanna married Giovanni della Rovere, a nephew of the pope. At his Urbino palace, which he greatly enlarged, he gathered one of the largest libraries of his time. The Sforza were another family of Italian condottieri, best known for having ruled Milan between 1450 and 1515. 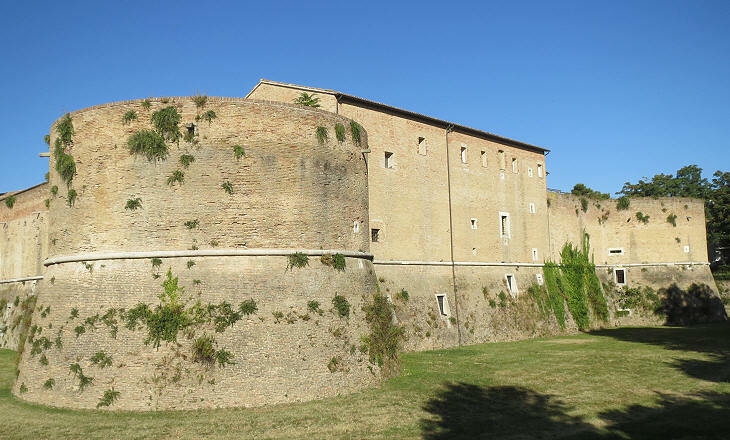 In 1444 Alessandro Sforza obtained the lordship of Pesaro from the Malatesta and in 1464 the fortress of Gradara from Pope Pius II. The Sforza acquired a fiefdom in Latium too. Ubaldini and Ordelaffi were other families who ruled over some of the towns covered in this section for short periods. In 1497 Giovanni Borgia, son of Pope Alexander VI, was assassinated under mysterious circumstances. The Pope asked Cesare, Giovanni's younger brother, to resign from being a cardinal and take the role of man of war of the family. 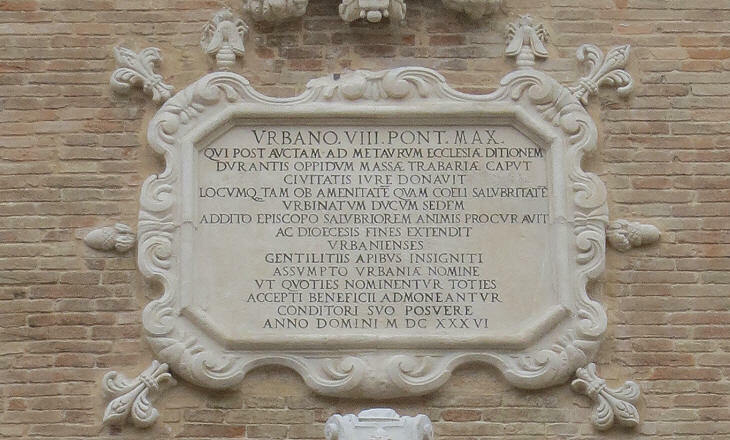 Pope Alexander deposed all his vicars in Montefeltro and in the nearby coastal towns and replaced them with Cesare. It was the beginning of a long period of sieges and battles. Cesare managed to conquer by force or deception the whole region, but revolts undermined his power. His father died in 1503 and after the brief pontificate of Pope Pius III, Cardinal Giuliano della Rovere was appointed Pope Julius II and soon deprived Cesare Borgia of all his titles and forced him to flee to Spain. 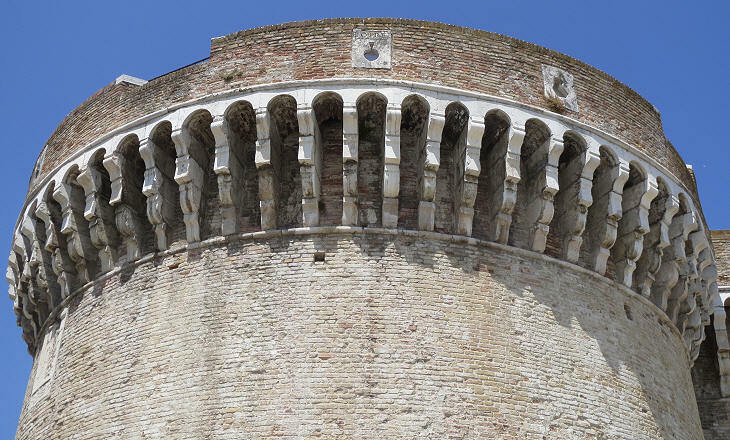 Eventually Rimini, Cesena and Fano became a direct possession of the Papal State, while the other towns and fortresses covered in this section became part of the Duchy of Urbino which included Gubbio. The last of the da Montefeltro died in 1508 with no issue after having adopted Francesco Maria I della Rovere, his sister's child and nephew of the Pope, as his heir. 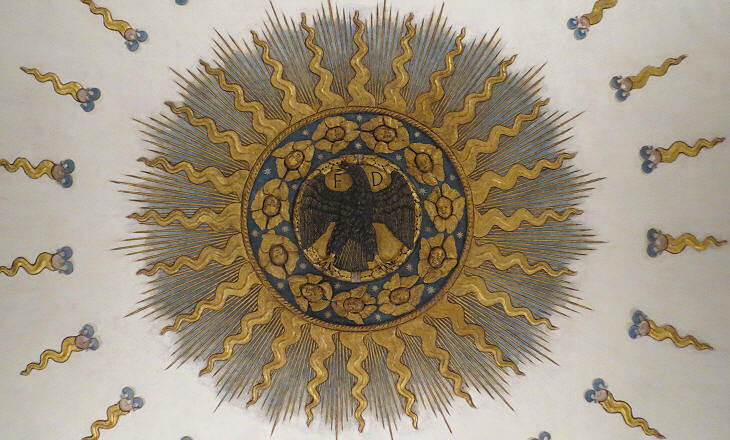 The della Rovere added the eagle of the da Montefeltro to the rovere (sessile oak) of their coat of arms to indicate the continuity of the dynasty. The della Rovere managed to retain control of the Duchy of Urbino throughout the XVIth century, with the exception of the period 1517-21, when the Duchy was ruled by Lorenzo de' Medici, nephew of Pope Leo X. In 1598 Lucrezia d'Este, wife of Duke Francesco Maria II died. The couple did not have issue, because they had lived separately for twenty years after the Duke had discovered her infidelity. He ruled as Vicar of the Pope and without an heir the Duchy was bound to return to the direct government of the Papal State. He then decided to marry Livia, his very young cousin. Several churches were built in the towns of the Duchy as ex-voto for the long awaited birth of Federico Ubaldo in 1605, six years after the wedding. The name Ubaldo was a tribute to the patron saint of Gubbio to whom the della Rovere were particularly devoted. 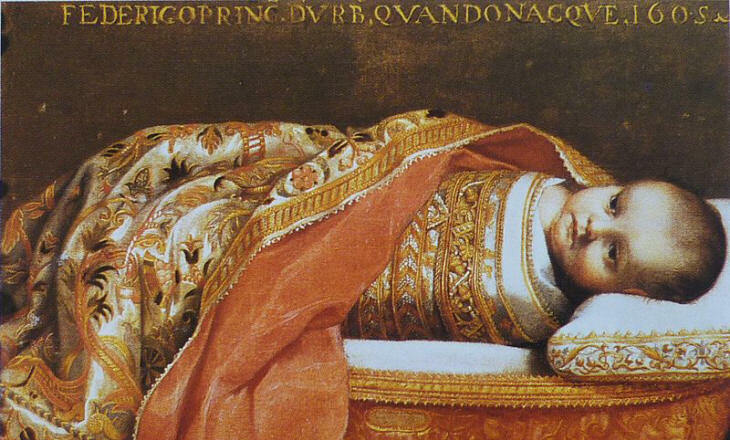 In 1621 Federico Ubaldo married Claudia de' Medici, daughter of Ferdinando I, Grand Duke of Tuscany and one year later the couple had a daughter, Vittoria, but in the next year Federico Ubaldo was found dead in his room. All the efforts to provide a heir to the Duchy had been in vain, because the role of Vicar of the Pope could not be assigned to a woman. Francesco Maria II negotiated the terms of a peaceful transition to the Papal State with Pope Urban VIII, which occurred at his death in 1631. Duke Francesco Maria II took care of the future of his granddaughter and he bequeathed her all his personal fortune including the family collection of paintings. By granting this dowry he was able to convince the Medici to agree to the marriage of Vittoria with the heir to the Grand Duchy. Many of the masterpieces of the Uffizi and Palatina Galleries in Florence, such as the Venus of Urbino by Titian (it opens in a separate window) once embellished the palaces of the da Montefeltro-della Rovere. The books of the Library of Urbino were moved to Rome by Pope Alexander VII when he founded Biblioteca Alessandrina. The monuments shown in this section are chiefly those built between the XVth and the XVIIth centuries. (*) Relief by Agostino di Duccio at Tempio Malatestiano in Rimini and portrait by Piero della Francesca at the Uffizi Gallery of Florence.